Leigh Magar makes some of the most sensational hats in Charleston, South Carolinaa city where a hat really means something. She outfits cookbook authors Matt Lee and Ted Lee in fedoras for a wonderful outdoor dinner party. Whether it's a baseball cap or a straw boater, a cloche or a four-foot-wide church bonnet, Southerners love the blast of self-expressionand the shadeof a great hat. Our friend Leigh Magar designs ravishing ones for Magar Hatworks in Charleston. Leigh Magar and Johnny Tucker. Photo © Fredrika Stjärne. We first met Leigh and her architect husband, Johnny Tucker, at a crab boil on the banks of a creek south of the city. The two of them appeared to have stepped out of a 1930s film. Her hat, a spray of feathers, was perched rakishly over an immaculate bob; he wore a three-piece suit and a leopard-print fedora. And then Leigh pulled from her handbag a red polka-dot apron, tied it on over her vintage dress, and proceeded to pick apart and devour the crabs on the table with a gusto unmatched by any of the good ol' boys in their camouflage caps. At any party, Leigh and Johnny are always the first to hit the oyster-shucking table and the last dancing on the porch, even when the candelabra above has begun to drip wax on everyone's heads. When she shows her hat collections, she turns that into a party, too. People come to the garden of her studio to drink tea (and quite a lot of wine), eat pimento-cheese sandwiches and watch models circulate among the fig and mulberry trees wearing Magar Hatworks's latest trilbies, fedoras and cocktail hats. Recently, Leigh packed up her fall collections and sent them on their way to Barneys New York and the Tokyo retailer Isetan. There was a brief lull before she would embark on a series of exclusive designs for New York designer Gary Graham. As her occasional cohosts, it seemed to us as good a time as any for a party in her garden. Photo © Fredrika Stjärne. When guests arrived and began to gather on the porch, we passed around lacy squash blossoms stuffed with red-pepper ricottaour riff on Leigh's pimento-cheese sandwiches and a tribute to Tuscany, where she and Johnny tied the knot. Leigh ladled out a fiery watermelon gazpacho with crab and avocadoa twist on Mary Randolph's "gaspacho," from the seminal Southern cookbook The Virginia Housewife, and our nod to Johnny's home state. "Ruined finerythat's all I have left," Leigh exclaimed wryly as she poured the magenta-hued soup into an antique bowl, quoting actress Mary Astor in the campy 1965 film Hush…Hush, Sweet Charlotte. She was apologizing for chips and hairline cracks in the bowl, from a treasured floral-patterned set handed down from her great-grandmother. That's so Leigh: A lot of folks in Charleston keep their heirlooms under glass, but she and Johnny refuse to. They're always in their best vintage clothes, whether at the farmers' market on any given Saturday or at a tony Spoleto Festival music fete; they clatter around town in an old Mercedes. Photo © Fredrika Stjärne. Leigh grew up northwest of Charleston in Spartanburg, and though she began sculpting in high school, she dreamed of handcrafting hats. She enrolled in the millinery program at the Fashion Institute of Technology in Manhattan, where she financed her studies by working as a live-in housekeeper and assisting Harlem hatmaker Rod Keenan. She moved back to Charleston in 1996, eventually opened an atelier on upper King Street, and in short order was juggling requests from high-end retailers, with custom work for locals and celebrities like Christina Aguilera and Michael Stipe. Leigh feels a strong connection between fashion, food and family history: "When I was growing up, we always had the tradition of dressing up on Sunday. So great meals and great design, and the whole ceremony of diningit's all related." Her kitchen bears that out. The perfectly seasoned cast-iron skillets in which we charred okra and corn were Leigh's great-grandmother's, as was the huge, sculptural Bundt pan that guests David Bouffard and Bill Bowick borrowed to bake a citrus-glazed pound cake for the party. Bill and David own Sugar Bakeshop, a local favorite for glamorous spins on Southern classics. Photo © Fredrika Stjärne. We poured Virginia wines throughout the meal, even with that pound-cake dessert: Thibaut-Janisson's sparkling Blanc de Chardonnay, an exciting collaboration between Claude Thibaut (an expat from France's Champagne region) and Champagne-based Manuel Janisson. Crisp and lemony, it was perfect with the citrusy cake. At the end of the party, one of the guests, the artist E.V. Day, swooped in to snap a photo of Leigh and Johnny lounging on the porch stairs. But first, some readjustment was required: Johnny was half hidden behind the riot of bright red feathers sprouting from Leigh's hat. "Have I told y'all I'm writing a memoir?" he asked the group gathered around. "It's called Feathers in My Face." Matt and Ted Lee's The Lee Bros. Southern Cookbook won the James Beard Foundation award for Cookbook of the Year in 2007. 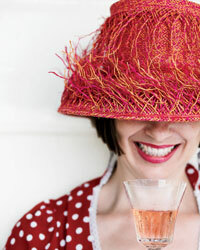 Leigh Magar names three favorite Charleston restaurants, and the Magar hat she likes to wear to each. 1. For lunch at Lana Restaurant & Bara Mediterranean-inspired spotI wear my Lulu hat, a natural cloche with a huge turquoise raffia flower. 2. At Fig, a restaurant committed to local and sustainable food, I dress up for dinner in a fancy tomato-red Gary Graham dress and my Nadine cocktail hat, covered in faux fruit. 3. I love the huevos rancheros for brunch at Hominy Grill. I prefer sitting outside, so I always wear my fuschia-orange Esther sun hat.